The Sam Houston Memorial Museum will open its doors to visitors on Saturday (Sept. 29), making “cultural education accessible to everyone” by allowing them to explore the museum for free as part of National Museum Day. In order to participate in the nationwide event, established as a Smithsonian Institution initiative, participants download a Museum Day Live! ticket at Smithsonian.com/museumday or Smithsonianmag.com/museumday, where they can receive free museum access to more than 1,400 participating venues, including the Sam Houston Memorial Museum, for two people. One ticket is permitted per household, per email address. “It’s a very simple process to get your ticket,” said Sam Houston Memorial Museum marketing coordinator Megan Buro. “Once you go to the Museum Day website, click on the ‘Ticket Information’ tab, fill out the contact information, and choose the museum you wish to visit (TX-Sam Houston Memorial Museum). This is the second year SHSU’s museum has participated in Museum Day, and a few people did take advantage of the free admission last year, according to Buro. Among these treasures are exhibits through which visitors can learn about who the general was and his life journey, as well as a permanent exhibit called “The Road to San Jacinto,” which was added in April 2011. “This exhibit includes artifacts from Bernardo Plantation, located in Hempstead, where Gen. Houston’s army camped at before heading to San Jacinto, as well as artifacts from the San Jacinto battlefield,” Buro said. “There are many more treasures in the rotunda including Santa Anna’s saddle during the San Jacinto campaign, Sam’s hickory cane and Stetson hat, the Bible of Sam Jr. (Sam and Margaret’s oldest child) that saved his life during the Civil War, the original headstone that was placed on the general’s grave at Oakwood Cemetery, and much more. “In addition to the artifacts, when visitors go out onto the grounds, they can visit the historic Woodland Home where the Houston’s raised their family, check out Sam’s law office, and stop by the Steamboat House, in which Sam died in 1863,” she said. More than 1,400 venues are participating for the eighth annual Museum Day Live, which drew over 350,000 museumgoers last year. 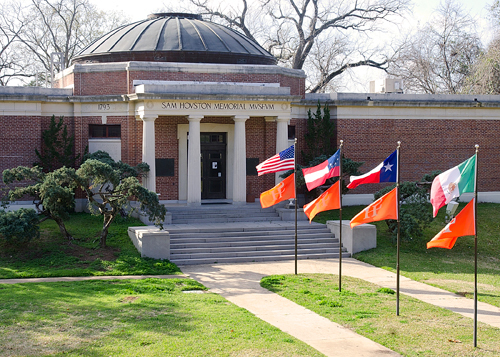 The Sam Houston Memorial Museum’s Saturday hours are from 9 a.m. to 4:30 p.m.
For more information, contact Buro at 936.294.3839 or mlb044@shsu.edu, or visit the museum online at Samhouston.memorial.museum/ or Facebook.com/samhouston.memorial.museum.